Wanted to give you an update on what we’re doing, as recently we’ve been getting people asking when we’re playing live next. If you haven’t seen via our other social media accounts, we’ve been in the studio recording. We’ve laid down tracks for 2 cover songs over at Freedom Soundworks Studios for the “Classics VS. Classics Vol. 3” compilation CD. After that, we’ll be recording a couple of our own songs as we’re planning on putting out an E.P. later this year. As we’re doing this we’re also working on new music. To keep up with what we’re up to keep an eye on our Facebook & Instagram pages as that’s where we post more often. Join us there and remember to Like & Share our posts! Next month we’ll be going into Freedom Soundworks Studios to record two songs for the “Classics VS. Classics Vol. 3” compilation CD due out later this year. We’re looking forward to working with Freedom Soundworks! We’ve heard “Classics Vs. Classics Vol. 1” and the production and sound quality is top notch! And really excited to get some new recordings out there. Vol. 2 was just released, and we’ll be included on Vol. 3 with a great mix of local talent doing a bunch of wild cover songs. It’s gonna be a great project and we’re glad we managed to get on board! And right before we go into the studio we’ll be doing one show, our first for 2019 at RAMS in Holbrook, NY, on February 8 and we’ll be celebrating Jose’s birthday! Join us on October 27 at The Village Pub as we celebrate the spooky holiday known as Halloween. Come in your scariest costume for a chance to win a prize from the awesome horror shirt company Fright Rags & more. 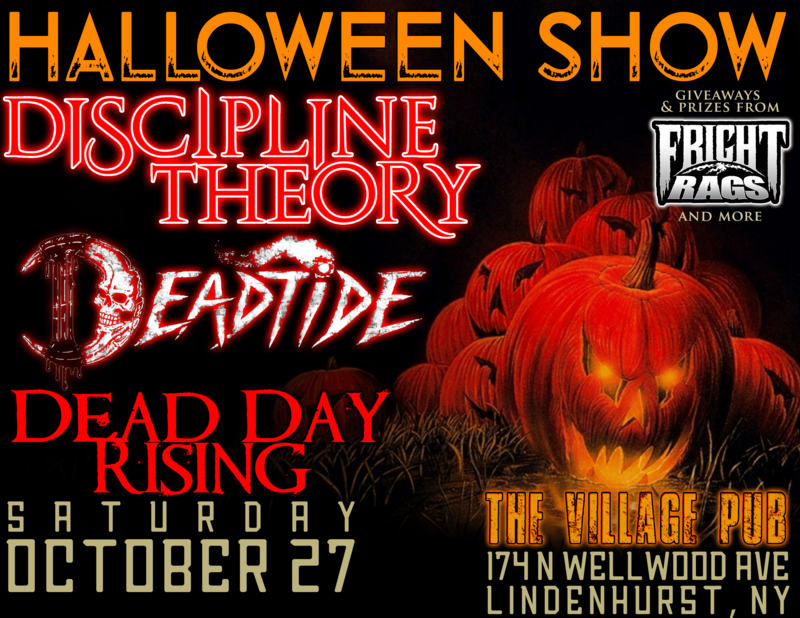 Making noise with us once again will be Dead Day Rising and coming in from NJ is Deadtide. Copyright © 2019, Discipline Theory. Proudly powered by WordPress. Blackoot design by Iceable Themes.